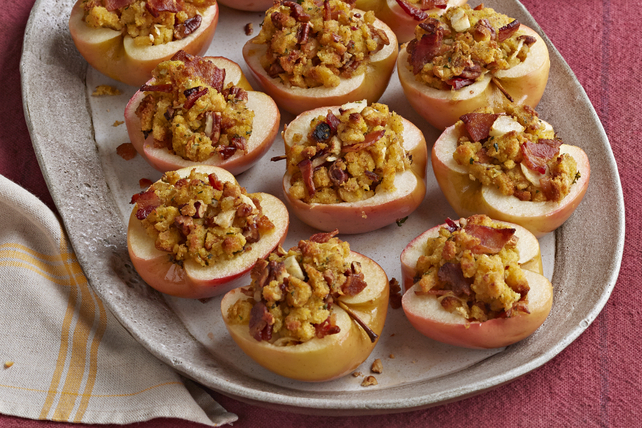 We've stuffed apples with a mixture of cornbread stuffing, apples, bacon and pecans. This simple side dish is as easy to make as it is delicious. Scoop out centres of apples, leaving 1/4-inch-thick shells. Chop enough removed apple to measure 1/2 cup; place in medium bowl. Discard remaining removed apple or reserve for another use. Add stuffing mix, hot water and bacon to chopped apples; mix lightly. Spoon into apple shells. Place in 13x9-inch baking dish. Bake 35 to 40 min. or until apples are tender. Prepare using any other cooking apple, such as Gala. Cut thin slice off bottom of each apple half to prevent the filled apple from tipping over in baking dish. Use a melon baller to easily remove centres of apples.